Creating skin care one small batch at a time. Rebekah's story . . . I was born with super sensitive skin . . . skin care products, laundry detergent, synthetic fabrics, even medications, would light my skin on fire with rashes, hives, or acne breakouts. Multiple trips to the dermatologist confirmed all my symptoms were a result of chemical sensitivities to everyday household and skin care products. Through trial and error, I identified ingredients that I could see were healthy and healing for my body. In small batches, I created cleansers, toners, and repair products for my personal use. My skin responded well and I stayed away from the dyes, scents and ingredients, (found in common products) that I had identified as unhealthy. Emotional trauma manifests in different ways and several years later it hit me hard. The stability I had gained with using my self-developed products early on, no longer could keep up with the personal trauma that I was experiencing. It caused weight to fall off my body, hair to come out in clumps-my body was not digesting nutrients. One day I had an epiphany, if nicotine or hormone patches could allow a person to access necessary nutrients or medications, why couldn’t I get nutrients to my body through my skin? I needed to feed my body in some way, and there were 20 square feet of transdermal potential just dying to absorb nutrients. With a degree in holistic health, my years of experience in producing my own well balanced healthy skin care products, I decided to leverage this knowledge and create a nutritional support system for my body. Each morning I enjoyed a daily hair/skin breakfast smoothie, and followed it with what became my VIRTUE SKINFOOD skincare treatment. Gradually, I began the journey back from illness to full-blown vibrant health. More requests arrived from other friends and then friends of friends. Sometimes the requests were accompanied for specific skin issues to be addressed, while others were for basic skin care help. That was the beginning of VIRTUE SKINCARE, it seemed to emerge overnight based on demand. From 30+ years of providing myself with a sensitive skin solution, to a line of products that uses the wisdom of natural plant medicine and food grade nutrition-now anyone can have a healthier body, inside and out. We have a true passion for skin. We all want healthier younger looking skin. Topically feeding our body nutrient rich natural healing skin care products instead of chemical products that introduce unwanted toxins into our system increasing the speed of aging. Now we can leverage the amazing capacity of our body to slow down the aging process using VIRTUE SKINFOOD, feeding our skin nutrients externally. Do you know what is in your skin care? And does it really work? What we put on the skin is ingested like anything we eat. Skin is the largest organ of the body and since it is porous, it absorbs whatever put on it. A study published in the American Journal of Public Health looked into the skin's absorption rates of chemicals found in drinking water. It showed that the skin absorbs an average of 64% of total contaminant dosage. Other studies found the face to be several times more permeable than broad body surfaces and an absorption rate of 100% for underarms and genitalia. And another peer-reviewed study showed 100% absorption for fragrance ingredients. Elevate your beauty routine. Virtue Skinfood skin elixirs and healing serums, are innovative skin care using pure, luxurious, organic natural ingredients. Using the wisdom of plant medicine and food grade nutrition VIRTUE SKINFOOD contains skin healing nutrients, vitamins and minerals, chosen for their natural skin repair. VIRTUE SKINFOOD never uses synthetic fragrances, artificial preservatives or inexpensive inert filler ingredients. Ensuring maximum concentration and healing power. We believe that Water Free is the future of beauty and wellness. No water means no bacteria, which means no preservatives which equals better skincare. Here’s why! A water-free formulation allows for improved stabilization, with no need for added emulsifiers or additives. For water-free products, instead of the base being water, a potent action-packed extract, botanical, butter or plant oil is the top ingredient, delivering higher performance and better results. When applied topically water can actually dry out skin; it evaporates and can take with it the skins precious natural oils, leaving the skin even more dehydrated. Think of what happens when you stay in a bath or pool too long. Additionally, fragrance, emulsifiers, and alcohol, and other chemicals dry the skin. As a result, the skin overproduces sebum to compensate –causing oily skin. If skin can’t decongest while under the chemical influence, acne may have be the outcome. Additionally, as shared above a study published in the American Journal of Public Health looked into the skin's absorption rates of chemicals found in drinking water. It showed that the skin absorbs an average of 64% of total contaminant dosage. Other studies found the face to be several times more permeable than broad body surfaces and an absorption rate of 100% for underarms and genitalia. When you remove chemicals and put nutrition packed ingredients on the skin, the skin no longer needs to compensate. When the skin experiences 100% active therapeutic ingredients, the skin can decongest and function normally, healing and balancing itself. Dry AND oily skin are symptoms of skin that is out of balance. 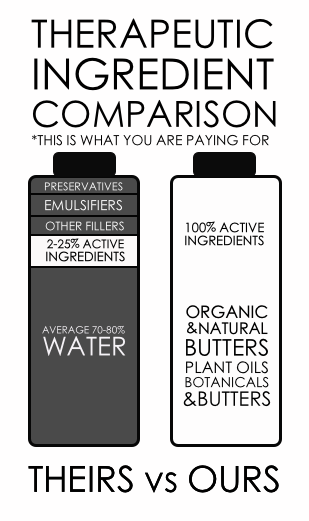 Cost comparison of skin care products is not based on ounces in the bottle, but the actual active ingredients. Do you know why? At first glance it can seem like water free skin care is more expensive than other skin care products. But not all products contents are equal. Fluid ounces are not actual active ingredients. Next time you hold a skin care product in your hand flip it over and see if it has water and if it does, where is its’ location is in the list of ingredients. If it is up front, you know the product is around 70-80% water, followed by preservatives and emulsifiers, and 2-25% will be actual (hopefully healthy) active ingredients. Keep this in mind when comparing products. Your dollar DOES go much further, when using water free products, as the skin requires much less, allowing many more applications, AND the contents are pure therapeutic skin nutrition. Is commercial skin care aging you? Commercial skin care contains 70-80% water (an inert ingredient), fragrance, emulsifiers, and alcohol, as well as other chemicals that dry the skin. Many commercial brands of moisturizers contain petroleum-based ingredients that can suffocate the skin. If skin can’t decongest while under the chemical influence, acne may be the outcome. Additionally, chemically laden products introduce unwanted toxins into our system, decreasing healing and repair, increasing the speed of aging. The good news is, when water and chemicals are removed and replaced with 100% healthy therapeutic Ingredients, skin no longer fights to compensate and can decongest and function normally, skin can heal and balance itself. Product Purity: Provides creation and distribution without additives or preservatives that can mess with our highly sensitive endocrine system. Intensifies Healing Properties: The purple light allowed through the glass actually increases the potent properties of vitamins, minerals and botanicals. Environmental Purity: Recycle with other glass bottles, no plastic to harm our planet, product contents do not contain synthetics or chemical components that enter the water eco-system when recycled. Extends Shelf Life: Storage test with tomatoes — check out the white paper on the 7-month microbiological test with a cherry tomato. Plastic is everywhere. Our throwaway mentality, fed by the mass production of plastics, has created a pollution problem. An estimated 4.7M tons of plastic ends up in our oceans each year and wave action turns them into a plastic soup, damaging sea life and marine ecosystems. The ocean is filled with 165M tons of plastic. A report from the Ellen MacArthur Foundation predicts, by 2050 there will be more plastic in the ocean by weight than fish. Choosing glass product packaging that can be easily recycled, and safe for the earth, especially our beautiful oceans contributes to doing our part. Ethical, heart centered living, makes life easier for all. Living Compassion: embraces all living beings with loving-kindness. Ahimsa is based on the premise that all living beings have the spark of divine spiritual energy; therefore, to hurt another being is to hurt oneself. This concept asks us to look at our local and global situations and to recognize how our personal and business choices cause ripples that affect others. Cruelty Free: Living with compassion for ourselves, our community, our earth, and the creatures that we share it with is foundational. Each product is so safe, that you can eat or drink it. So there is no need to test on animals. Clean NOT Clinical for Daily Usage: We believe any product ingested by the skin on a daily basis, should be clean and not clinical. Our products are fully bio-degradable, containing NO water, which means NO bacteria, which means NO preservatives, so not only is it safe for skin, it is also safe for flowing back into our earth’s eco system, with no (endocrine) disruption to any creature. Using clean skin care helps us heal ourselves and our environment.